Petra Laboy Martinez daughter of the late Lucia Lopez and Ernesto Laboy was born on May 13, 1935 in Puerto Rico. 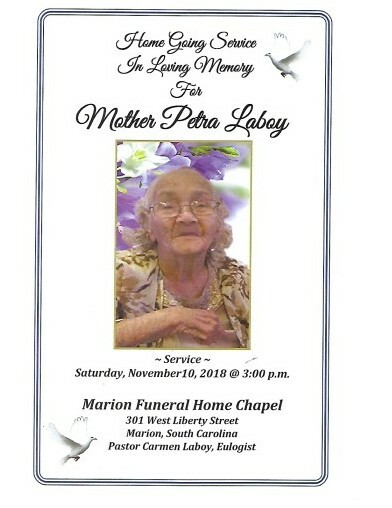 Petra departed this earthly life on Wednesday, November 1, 2018 at Carloinas Hospital System in Florence, SC. Petra Martinez was filled with lots of love and laughter. Everyone who knew her loved her presence. Not matter what was going on in our lives, one of her favorite quotes was ("It's O.K.") She will truly be missed. She was preceded in death by her parents; husband: Victor Martinez Sr.; one son: Jose "Che" Martinez; a brother: Juan Cintron; a son-n-law: Felix Rodrizuez; two great, great grandchildren: Jordan and Maliyah. Petra leaves to cherish loving memories ~ five sons: Victor (Carmen) Laboy of the home; Robert (Karmen) Martinez of Port St. Lucie, Florida, David Martinez of Philadelphia, PA, Manuel Laboy and Benjamin Laboy; six daughters: Suzie Rodrizuez of Philadelphia, PA, Aslan (Miguel) Diaz of Hobe Sound, Florida, Mary (Alex) Diaz of Port St. Lucie, Florida, Jessie Lopez of Philadelphia, PA, Aida and Juana of Puerto Rico and Enestina; one sister: Dominga Cintron of Rhode Island; forty-five grands, sixty-two great grandchildren, four great, great grandchildren and a host of nieces, nephews, other relatives and friends.